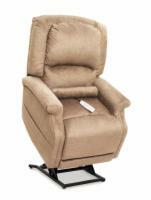 All Lift Chairs adds the Golden Cloud PR-510! April 26th, 2012 - Raleigh, NC - All Lift Chairs, an online retailer of lift chairs for the disabled and elderly, is excited to announce the their newest lift chair the Golden Cloud PR-510. "The PR-510 is something that we're glad to bring to All Lift Chairs," says Tim Ziehwein, Vice President of Sales for All Lift Chairs. "With it's overstuffed biscuit design, we think that this will definitely be a hit, with all of our customers." The Cloud PR-510 is a Zero Gravity lift chair, is designed with an overstuffed back cushion to give it maximum comfort. The PR-510 comes in five possible fabric options and is availabe immediately with a starting price point of $1,264. All-Lift-Chairs.com is an online retailer of lift chairs and bath lifts, for the disabled and elderly. Their product catalog includes lift chairs from some of the top lift chair manufacturers in the US including Pride Mobility, AmeriGlide, and Golden Technologies. For more information, please visit www.All-lift-chairs.com.